When you are solving questions with exponents, you must keep in mind that order of operation (BEDMAS/PEDMAS) still applies. In this lesson, we will get you familiar with how BEDMAS/PEDMAS works with exponents. A small yellow square is put on top of a large green square. 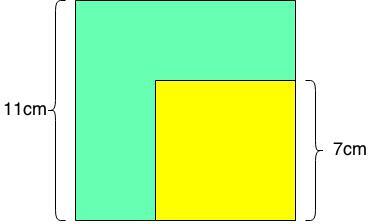 The side length of the yellow square is 7 cm, whereas the side length of the green square is 11 cm. Write the visible green area as powers. Calculate the visible green area.